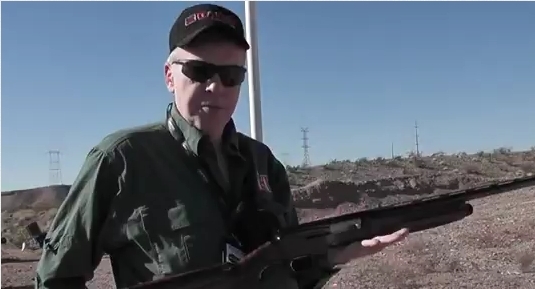 The recoil operated A5 is one of the few truly new autoloading shotguns for 2012. It is interesting on several levels. While Browning started with recoil-operated shotguns and didn't delve into gas actions until the B-2000 that was released in late 1973, they've not released a new recoil gun since the A500 (later designated the A500R) from 1987. The A500 was not a huge success, to be charitable, nor was Val Browning's Double Automatic that preceded it. The original Automatic-Five, one of the most influential shotguns in history, was finally discontinued in 1999 after close to a century of production. The John Browning long recoil action is still in production even today, as the Franchi 48-AL. 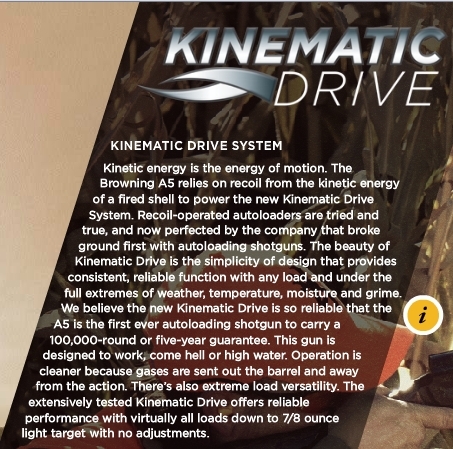 For some fourteen years, Browning has been out of the recoil autoloader market, a market they initiated. The recoil, or non-gas autoloader segment has been totally dominated by the Benelli family of autoloaders, including the Franchi and Stoeger brands. The basic Benelli action goes back to the Bruno Civolani design of the 1960s, a design purchased by the Benelli motorcycle company family. The Benelli firearms division began around 1967. Shotgunners have always been a bit decisionally challenged when it comes to figuring out what they want to shoot. Of late, the 3-1/2 inch autoloaders have become common, though many of them never see a 3-1/2 inch shell and a goodly number never see a 3 inch shell. So, we buy 12 gauge Super Magnums just in case, but the case never comes, then we get to carp because they don't cycle with 20 gauge payloads, 20 gauge light target payloads at that. It makes no sense, but these things don't have to. Though the classic A-5 has always been easy to set-up up, as far as I'm concerned, the simplest adjustment is beyond what many of today's shooters want. No adjustment regardless of load is what we claim to want. Just as soon as 12 gauge autoloaders began to handle 1 oz. loads, we wanted them to handle 7/8 oz. loads and now, 3/4 oz. 28 gauge genre loads. Browning claims down to 7/8 oz. 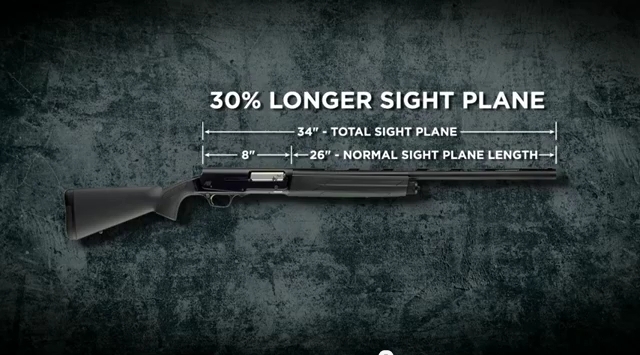 target load ability with the new A5, while most 12 ga. Benelli's are stated (by Benelli) to use 1-1/8 oz. 1200 fps loads as a minimum. Browning normally isn't as bad as some when it comes to silly hyperbole. With the A5, the only nod to absurdity is the humpback target acquisition advantage. Sighting plane length is between your eye and the front bead, a soft focus reference point. While a 26 inch barreled A5 is supposed to give you a 30% sighting plane advantage, it gives you nothing. A 26 in. Maxus has a 14-1/4 inch length of pull, the overall length is 47-1/4 inches. A 26 inch A5 has a 14-1/4 length of pull as well, with an overall length of 47-5/8 inches. If there is a sighting plane advantage to the A5, it would be about 3/8 of an inch, which is to say-- there is no particular advantage at all. It makes for a good, if completely laughable, story though. Something like the idea that a two inch longer barrel does much more than get you two inches closer to the target; which is about all it can do. It is just like comedy. The Kinematic Drive has 4 lugs on the rotating bolt. 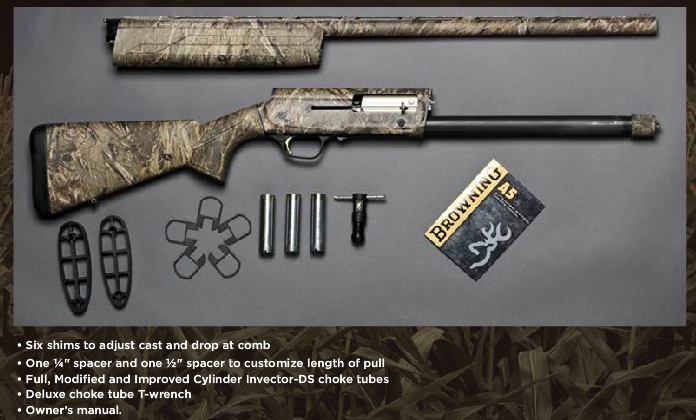 Browning claims it takes 30% less rearward travel for the bolt to unlock and this means a 10% faster rate of fire than the Benelli inertia drive. A faster rate of fire is trivia on an autoloader, as always, and the "100,000 Round or Five Year Warranty" translated into English, means a 5 Year Warranty. Seeting aside some of the kittens and sunshine blurbs, there is a lot to like in the new A5. Browning speed-loading is the best shell-handling on the market today, just the ticket for a busy dove field, and the new A5 retains this. The walnut A5 Hunter that I test-fired is light, perhaps 6-3/4 lbs., a bit lighter than the Maxus or the Vinci, and holds great appeal for chasing pheasants. While the only shell used was 1-1/8 oz. Federal Gold Medals at 1145 fps, the A5 was very, very comfortable to shoot which suggests to me the Inflex II pad is more than just another recoil pad. The new A5s have center barrel beads, a ridiculous addition to hunting guns no matter who does it, so lets hope they are easy to snap off and throw away. I found the A5 trigger to be light and crisp, better than any Browning autoloader in recent memory out of the box. I also liked the safety positioning. The Invector DS chokes postively eliminate any potential for choke-tube loosening, so they are of tangible advantage as well. As of this writing, early February 2012, actual A5 production has not yet begun yet andd no form delivery dates have been established. The new "Invector DS" choke tubes, introduced with the 725, are made in France and the vendor is apparently having a difficult time keeping up. Perhaps this will be resolved by the time the A5 is actually released. So, the rest will have to wait until a test gun arrives. Aside from a stand-alone review of the A5, the idea is to do a three-way comparison of the A5, the Benelli Vinci, and the new Franchi Affinity. They are all recent or new offerings, all three inch chambered 12 gauges, and all recoil actions. So that should make for both a fair and interesting match-up. Copyright 2012 by Randy Wakeman. All Rights Reserved.